If the title of this blog post made you excited about your stock portfolio, I apologize for misleading you. However, the truth is that things at the Dow Center are looking up, especially as it relates to student/faculty exercise and recreation opportunities. If you haven’t stepped foot into the Dow since your Health Dynamics class, it’s time to plan a visit or better yet, reserve some space to work out with your friends. 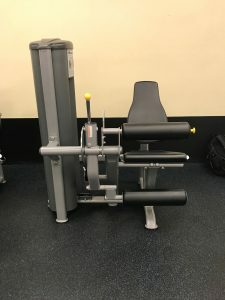 We have several new machines: Leg extension/leg curl machine (pictured), a cable crossover machine (arriving any day! ), 3 treadmills, 2 ellipticals and 2 stationary bikes. 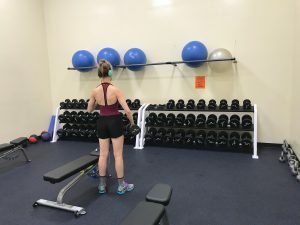 After a summer and early fall filled with shopping, placing orders, and re-arranging, the Dow Center has some new equipment and space that will increase opportunities for participation in exercise or activities within the building. The 175,000 square-foot Dow Center was constructed in 1978 and contains courts for basketball, volleyball, racquetball, and wallyball as well as a 1/10th mile indoor track, a swimming pool, and cardio /weight rooms. In addition to its physical activity use by the campus community, the Dow also houses our Dance Department and their studios, academic classrooms, the Foundations for Fitness program, Hope College’s Student Health Center, and an athletic training room. Here’s the best part…rooms, courts and space for recreational activities can be reserved by anyone or any group on campus. Here’s the best part…rooms, courts and space for recreational activities can be reserved by anyone or any group on campus. If you are planning more than 24 hours in advance, please reserve via events.hope.edu. For reservations within 24 hours, please call 616-395-7702 to check on availability. Pictured is the 1000 square foot expansion to the weight room featuring free weights, plyometric jump boxes and much more. Morehouse also wants to remind students that the Dow has added a group exercise area for student reservations. This 20’ X 40’ area is ideal for yoga, pilates, or any other group fitness activities. Exercise mats are available for student usage in this area. Students simply need to call 395-7702 for a reservation on the day they plan to use it. Along with the increased opportunities for recreation at the Dow Center, a new access system is up and running as well. This new system allows faculty, staff, students and community members to scan an ID card in order to gain entrance to the facility. This is a key component in maintaining a safe and secure facility for our users. If you have any questions please feel free to contact Brian Morehouse at morehouse@hope.edu. Otherwise, round up your friends, head over to the Dow, see the exciting changes and get your sweat on!